Port Washington, N.Y. — A transcendental experience awaits with the new Nirvana Smart Fan by Modern Forms. Enlighten any room or living space with this smart fan, which is powered by a DC motor that runs smoothly and quietly. For unprecedented control, connect with the exclusive Modern Forms app to create schedules, integrate with smart home devices, and more. An energy efficient LED luminaire powered by WAC Lighting rounds out the design. The new wet-rated Nirvana features a scalable RF wall panel for local access and instant everyday control; additional wall controls are available for 3- or 4-way control. Nirvana syncs with the exclusive Modern Forms app via Wi-Fi from anywhere in the world to control fan speed and luminaire, and adapt to your schedule while reducing energy costs and making life simpler all year-round. It allows multiple users to securely program the fan, making it suitable for homeowners and hospitality environments alike. Patent pending functionalities allow for multiple fans on one circuit as never before. The smart fan integrates seamlessly with leading smart home devices you already own, including Google Assistant, Amazon Echo and Samsung SmartThings, as well as smart thermostats such as Nest and ecobee, using voice command for energy savings and the ultimate in home innovation. The devices will turn your fan and luminaire on and off, change speeds, reverse the rotation of the blades, and dim the lights beautifully. A testament to the Modern Forms brand, Nirvana is beautifully engineered and uses a DC motor that runs 70% more energy efficient than traditional AC motors. The fan is crafted with aluminum hardware and integrates an LED luminaire that deploys 1600 lumens and robust illumination. The indoor/outdoor smart fan is available in four stunning finishes are available: glossy white, koa, matte black and titanium silver. Engineered to the finest detail for unsurpassed performance and design sophistication, Modern Forms is a future-forward manufacturer and innovative brand of unique upscale all-LED luminaires, and a groundbreaking new line of smart interior and exterior ceiling fans. Originally a subsidiary of the WAC Lighting Company group of brands, Modern Forms took North America by storm in the last six years with avant-garde designs that leverage advanced LED technology developed exclusively by WAC engineering. Now it is the leading independent provider of technology and modern design in lighting and smart fans. 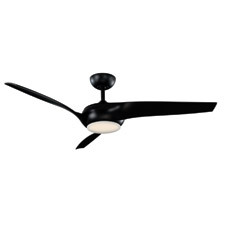 Modern Forms Fans are designed to revolve around you. They represent the future of modern smart fans, designed to adapt to your routine, reduce energy costs and make life simpler all year-round. No other company in the industry offers the seamless technological innovation, elite craftsmanship and sleek style across such as vast selection.